Karnataka Assembly elections: The Election Commission Tuesday announced that Karnataka will go to polls in one phase on May 12, and the results will be declared on May 15. The 224-member House expires on May 28 this year. 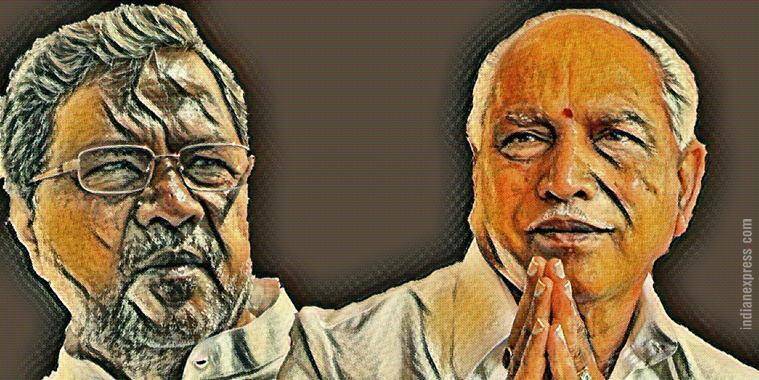 The Congress has picked incumbent Chief Minister Siddaramaiah as its CM face, while the BJP has nominated former CM B S Yeddyurappa. The Election Commission Tuesday announced that Karnataka will go to polls in one phase on May 12, and the results will be declared on May 15. The 224-member House expires on May 28 this year. The Model Code of Conduct is now in play in the state. The Congress is currently in power in Karnataka with 122 seats against the BJP’s 43. The state is one of the eight states that go to polls this year and will set the tone for the 2019 Lok Sabha elections. The Congress has picked incumbent Chief Minister Siddaramaiah as its CM face, while the BJP has nominated former CM B S Yeddyurappa. During the press conference this morning, the EC was apprised of a tweet posted by BJP IT cell head Amit Malviya, who listed out the dates for the elections. Malviya had tweeted while the presser was underway, but the dates hadn’t been announced. CEC O P Rawat said an investigation into the incident will be held and action will be taken accordingly.